Northwestern’s non-tenure eligible faculty filed unfair labor practice charges Thursday against Northwestern because the University has not begun collective bargaining negotiations with the union. In June 2016, faculty at Northwestern filed for an election to form a union representing non-tenure eligible faculty. Due to several contested ballots, majority support for joining Service Employees International Union was not confirmed until May. 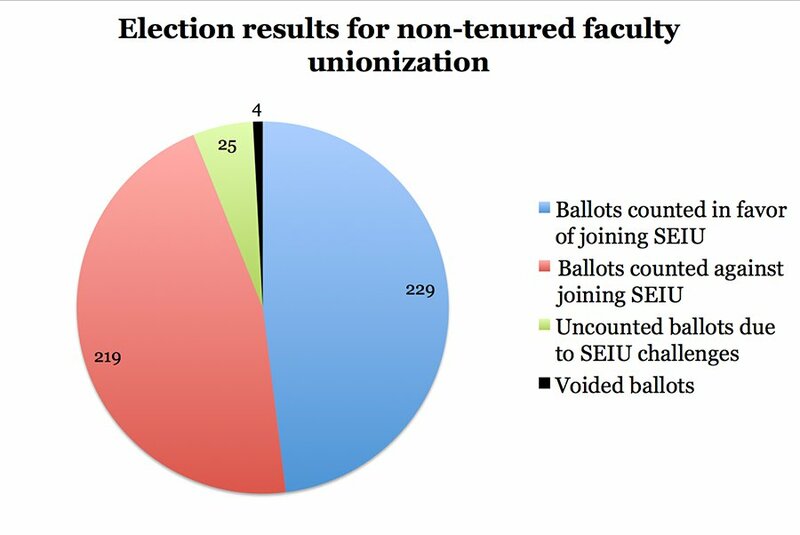 According to a National Labor Relations Board document obtained by The Daily, 229 non-tenure eligible faculty voted in favor of joining SEIU and 219 voted against it. Twenty-five ballots remained uncounted after being challenged by SEIU. Northwestern appealed the 25 ballots with the National Labor Relations Board, University spokesman Al Cubbage told The Daily in July. He said the University won’t begin bargaining until all the ballots have been counted, and the appeal is still pending. The University has asked SEIU to “withdraw its objections” to the 25 ballots, Holloway said in the statement. Every ballot must be counted so the University and non-tenure eligible faculty can move forward with certainty, he said. “We have strong working relationships with unions that represent a number of Northwestern employees, and should the final results of this election indicate a majority of the non-tenure eligible faculty voted for a union, we are committed to forming a productive relationship with this new union as well,” Holloway said in the statement.